Lying on the banks of the Thu Bon River, Quảng Nam province ( in the South Central Coast of Vietnam), Hoi An Ancient Town is an exceptionally well-preserved example of a South-East Asian trading port dating fr0m the 15th to the 19th century. 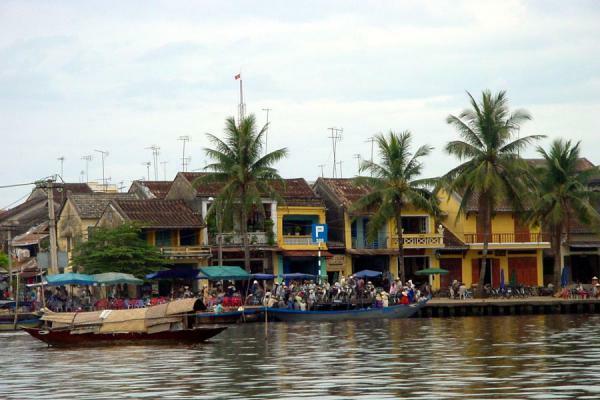 Criterion (V): Hoi An is an exceptionally well preserved example of a traditional Asian trading port. Occupied by early western traders, Hoi An was one of the major trading centers of Southeast Asia in the 16th century and 17th centuries, whe-re Chinese fr0m various provinces as well as Japanese, Dutch and Indians settled down. No fluorescent lights, no motorcycles, no television, on the 15th day of each lunar month, the riverside town of Hoi An gives modern life the night off. In a wood-fronted shops a woman in traditional dress sits at a desk, bathed in the light of a lantern made fr0m a simple bamboo fish-trap. Outside, two old men are absorbed in a candlelit game of Chinese checkers. Hoi An, a sleepy riverside town in the central province of Quang Nam. In the air of legendary, just experience the existence by tasting and feeling. These diverse cultural influences remain visible today. Visitors will find Hoi An's Old Quarter lined with two-storey Chinese shops, their elaborately carved wooden facades and moss-covered tile roofs having withstood the ravages of more than 300 years of weather and warfare. These proud old buildings, which back onto the river, remind visitors of another era, when Hoi An's market was filled with wares fr0m as far afield as India and Europe. Colourful guildhalls, founded by ethnic Chinese fr0m Guangdong and Fujian provinces, stand quietly, a testament to the town's trading roots. While Hoi An's old-fashioned ch@rm is always visible, on the 15th of every lunar month modernity takes another step back. On these evenings the town turns off its street lamps and fluorescent lights, leaving the Old Quarter bathed in the warm glow of coloured silk, glass and paper lanterns. In ancient times, Vietnamese people made lamps out of shallow bowls filled with oil. Later, foreign traders introduced lanterns, ranging fr0m round and hexagonal designs fr0m China to diamond and star shaped ones fr0m Japan. When developing plans to preserve their town's ancient ch@racter, Hoi An residents decided to revive the practice of using coloured lanterns. Starting in the fall of 1998, one night each month is declared a "lantern festival". On the 15th day of each lunar month, residents on Tran Phu, Nguyen Thai Hoc, Le Loi and Bach Dang streets switch off their lights and hang cloth and paper lanterns on their porches and windows. Television sets, radios, street lights and neon lights are turned off. In the ensuing quiet the streets of Hoi An are at their most romantic, the darkness broken only by jeweltoned lanterns in all manner of shapes and sizes. Strolling through the lantern-lit streets is like walking into a fairytale. It is all the more picturesque since motor vehicles are banned fr0m Hoi An's Old Quarter. On Trai Phu Street, stop at the beautifully preserved Faifo Restaurant to sample some traditional Chinese-style pastries. Or walk on to the Treated Caf6, whe-re bamboo baskets, commonly used to wash rice, have been transformed into unique lanterns. These basket lamps are but one example of people's creativity as they experiment with new shapes and materials, including lights made fr0m hollow bamboo tubes. Tourists can visit the relics of the Sa Huynh and Cham cultures. They can also enjoy the beautiful scenery of the romantic Hoi An River, Cua Dai Beach, and Cham Island.